Road rage accidents can be extremely scary experiences. It is always unsettling to anger a complete stranger and be totally at the mercy of his temper. And, as we all know, there are plenty of us walking around (and driving around!) with bad tempers just waiting to be set off. When that happens, our roadways in Maryland become treacherous places. Road rage accidents are as scary as they are typical these days. 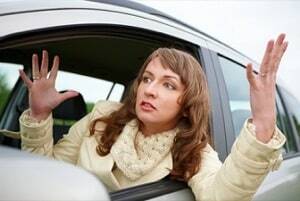 Consider the following statistics: Half of all drivers who have been on the receiving end of an obscene gesture, been cut off, or been tailgated admit to responding by honking their horns, lofting their own obscene gestures, and tailgating or cutting off the other driver. Some people, about 27 percent of those polled, admitted to screaming back at the other driver even though they knew they could not be heard. And the most frightening statistic to emerge is that 2 percent of drivers admitted to trying to run the aggressor off the road! Given the amount of admittedly hot-tempered drivers out there, it is easy to see how road rage accidents have become so common. A motorist “steals” a parking space from another motorist, causing words to be exchanged. The angry motorist then rams his car into the back of the car parked in the space, injuring the driver, or worse, a pedestrian caught in the crossfire. A motorist cuts another motorist off on the freeway, angering the other driver and prompting him to aggressively tailgate and rear end the motorist. A motorist becomes angry at the slow speed of the car in front of him and tailgates that car, rear ending it and causing a multi-car accident. Under Maryland law and the language of the auto insurance policies written here, car insurance will not pay for punitive damages for intentionally caused harm. So if someone tries to crash into you in anger in a road rage type scenario, the insurer is not going to pay any punitive damages award (or any other damages for that matter). But Maryland law seemingly allows punitive damages in uninsured and uninsured motorist cases. So if someone who has either no or limited insurance intentionally causes a collision, you can sue that driver for all damages, including punitive damages, and your own insurer is obligated to pay those damages. This surprises people and sounds illogical at first glance. But the law sometimes makes sense, not by looking at a piece of the puzzle, but by seeing the entire puzzle. So when a driver intentionally hits your vehicle, he essentially becomes uninsured. Ironically, if you have a large uninsured motorist policy, you are probably better off - for lots of reasons - by getting hit by a driver intentionally in a road rage claim then you would be in an ordinary traffic collision. Nate is a real hot-headed guy. We all know some version of this guy. In high school, he was expelled from two different schools for fighting and using abusive language to other students and teachers. Even though he was punished for his anger problem, he never thought it necessary to get help. To Nate, a hot temper is the sign of a real man who is willing to defend himself in any confrontation. To say the least, physical confrontation is clearly something Nate does not avoid. As Nate pulls out of his driveway, he hangs a quick right at the light and proceeds onto Wisconsin Avenue in Bethesda. As he drives along blaring loud, aggressive rap music and hanging his head out of the driver's window as he puffs on a cigarette, he notices that the man in the car in front of him is driving a few miles below the speed limit. That driver, Bob, is simply a careful driver who always abides by the speed limit. But to Nate, Bob’s slow speed is impeding his travel and, he thinks, is a direct act of disrespect aimed his way. Nate, getting impatient and angry, starts to tailgate very closely behind Bob’s car to give Bob the message that he should get out of the way. But Bob, careful and patient, refuses to be rushed and chooses to ignore Nate. Being ignored, however, makes Nate extremely angry. He pulls into the adjacent lane and gets right up close to Bob’s window, giving him the finger and spewing profanity at him. Bob is startled, as anyone would be, but he continues to proceed carefully and to ignore Nate as best he can. Again, Nate hates being ignored. He decides he should sharply cut in front of Bob as a means of revenge. As he cuts Bob off, Bob is unable to stop in time to avoid colliding with the rear of Nate’s vehicle. Bob loses control of his car, which flips over and slides off the road. Bob is paralyzed from the waist down and must be airlifted to a hospital where administering emergency aid failed to save the use of his legs. This accident, we would argue, is Nate’s fault and his insurance carrier should be made to compensate Bob for his injuries. Massachusetts: $2,100,000 Verdict. The plaintiff was visiting a friend when she admittedly parked her vehicle in such a way that made it difficult for her friend's neighbor, the defendant, to exit. The plaintiff was preparing to leave when defendant backed down the driveway. He became enraged because the plaintiff was blocking his path. The defendant repeatedly backed his vehicle into the plaintiff's car. He then exited his vehicle and threatened to slash the plaintiff's tires and kill her. The plaintiff suffered head injuries, memory loss, and severe emotional distress. (ANTONIA IANTOSCA v. DONALD R. KEDDY, JAS MA Ref. No. 260409WL). New Jersey: $1,250,000 Verdict. The plaintiff driver contended that after apparently swerving in front of the defendant to reach the E-Z Pass lane at a toll, the defendant showed road rage, began tailgating and changing lanes in an effort to prevent her from getting away from him. The plaintiff maintained that after proceeding a relatively short distance beyond the toll, it became apparent that the defendant was tailgating her. The plaintiff related that when it was safe to do so, she activated her right blinker to move over and let the defendant go by. The plaintiff contended that the defendant then abruptly went to the right lane to prevent plaintiff's lane change, got alongside her and boxed her into the left lane. The plaintiff maintained that the defendant then abruptly changed to the left lane, and that she drove onto the shoulder to avoid impact. The plaintiff said that she then sped up, but since the shoulder was ending, she moved in front of the defendant, who struck her car in the rear causing her to fishtail and spin out of control into the center divider and severely injure her neck and back. (VASISHT vs. KUGAL, 34 NJ. J.V.R.A. 5:C3). 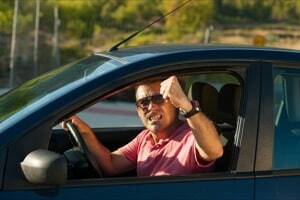 Road rage accidents are both scary and severe. If you have been the victim of an angry driver who caused an accident that left you injured, you may have a claim. At Miller & Zois, we have a track record of success and can help you evaluate and bring that claim. Please contact us at 800-553-8082 or get a free case evaluation online.